Imagine you bought a ticket for a football game and on the day of the match you feel sick. Would you go because staying at home is a waste of money? If you answer “yes” the sunk cost fallacy is at work. The fact that you spent the money should not play a role in your decision; you can’t get it back. If going will make your life worse you should stay at home. People like to think they make rational decisions based on the future value of something. But in reality many decisions are influenced by the time, money, love and/or energy invested. This makes it harder to abandon. In Thinking Fast and Slow Kahneman and Tversky conducted an experiment to demonstrate the sunk cost fallacy. Imagine you go and see a $10 movie and lose $10 cash on the way to the cinema, would you still buy a ticket? In the experiment only 12% of the people said they wouldn’t. Now imagine you bought a $10 movie ticket and lost it. Would you buy another ticket? In this case a whooping 54% of the people said they wouldn’t. The situation is identical, in both scenarios $10 is lost, but in the case of the ticket it seems it was assigned to a specific purpose and then lost. This is the sunk cost fallacy at work. Amateur investors make negative Expected Value decisions because of the sunk cost fallacy. They often base their trading decision on acquisition prices. If traders lose money on a stock they are, illogically, more hesitant to sell. The acquisition price should not be play a role in the decision; all that matters is the future value of the stock. Professional poker players are aware of this flaw in thinking. Every dollar that a player puts in the pot is not theirs anymore and should not be a factor later in the hand. Professional poker players let the past not dictate their thought process; they are comfortable folding a hand without regard to the money invested. The sunk cost fallacy manifests in many different ways: Do you keep reading a boring book that likely isn’t getting better? The time you’ve invested in reading the book is not important, if you don’t like it put it away. You only waste more time. Our investment of time, money, love and/or energy is often the reason we carry on despite that we are dealing with a lost cause. Because of the sunk cost fallacy you keep reading a book you don’t like and hold on to stocks that should be sold. Investments that are gone and cannot be recovered should not matter in your decision making process; you should make rational decisions based on the future value. Finally, apply this concept to your own life. Take a step back from the projects you currently invest time and money in and ask yourself; Am I working on these projects because of previous investments or are they still the best use of my time and money at the present moment? Expected value is one of the most important decision making concepts that people almost never use. Professional poker players apply the concept to make rational decisions, but in business most decisions are based on emotions. This tendency most likely costs you a fortune. The concept of expected value will help you to identify profitable business situations that would be otherwise missed. Expected value is a predicted value of a variable, calculated as the sum of all possible values each multiplied by the probability of its occurrence. In other words, the expected value shows us how much we can expect to win or lose (on average) in a specific situation. Let’s look at a classic example: the coin flip. If we flip a fair coin we have a 50% chance of coming up heads and a 50% chance of coming up tails. Assume that we get $10 every time it comes up heads and $0 when it comes up tails. In this situation there is a 50% chance of getting $10 and a 50% chance of getting $0. On average we expect to get $5. It seems obvious that on average we get $5, however this can feel somewhat unintuitive because we never actually get $5; we get either $10 or $0. The expected value of $5 is what we would get, on average, if we repeat the scenario an infinite number of times. If we flip the coin often enough we overcome the short-term variance and end up with an equal number of heads and tails. If the coin is rigged and comes up with heads 90% of the time the expected value is 90% times $10 or $9. If we flip the rigged coin 1000 times we expect to make $9,000. Professional poker players constantly calculate expected value and when they identify a situation that gives them a small edge they push it over and over again. Finding positive expected value situations is what enables them to earn money. Let’s look at a simplified example. You are a professional poker player playing against an amateur, or fish as bad players are called. You raise pre-flop and the fish calls. There is $200 in the pot. On average you expect to win $50 with this play. See that we have not even discussed what cards we have in our hand yet? That is irrelevant in this situation because we have a positive expected value move no matter what cards you hold. Other players might say you’re crazy for betting $100 when you end up having to show a bad hand. Or they might think the reason for your constant betting is that you have a lucky card streak. But you know, regardless if you win or lose this hand, that your move will make you money in the long-term. Expected value encourages risks when it makes sense. It seems straightforward to always play the positive expected value situations, but in reality most people constantly pass on these situations. Results orientated thinking, variance and cognitive biases make that people pick more losing than winning plays. Even if we make the correct decision and play in situations where we have an edge we won’t always win. If we only take rigged coin flips that give us a 90% chance of winning we can expect to win very often. In other words, we lose only a few times which means that we experience little variance. On the contrary, if we start taking coin flips where we have 51% chance of winning we start losing a lot more. Despite the fact that we start losing a lot more we still make a profitable decision by pushing the small edge. If we would draw our winnings in a graph we see that only taking 90% chances will lead to a steady increase with little variance. If we also push small edges our winnings will go up and down much more often. But in the long-term we will earn a lot more money. By passing on small edges we hurt ourselves, we give up money. It is likely that people think we are crazy when we take a 51% expected value situation and lose. Especially if we lose people are quick to judge, they think results orientated. But it is not about this one situation that is lost, it is about the long-term. If we keep making profitable decisions all the time we will end up far ahead. A lifetime of taking the positive expected value move will result in many more wins than losses. Always think in long-term profitability and forget about the short-term variance. You can lose while making the right decision, but don’t be results orientated and keep pushing small edges. It may seem that expected value only applies to situations where we make the same decision over and over. If we flip the coin 1000 times we can expect that the rigged coin will be heads 90% of the time. But if we only flip once and we lose the expected value seems not to be important. This is wrong. We have to consistently calculate the expected value of our decisions and in the long-term we will win enough times that we end up ahead. We want to take calculated risks when it makes sense. Unfortunately our cognitive biases often prevent this from happening. If you have two people and one wins $100 on the coin flip and the other loses $100 on the coin flip you would expect that person 1 would gain as much satisfaction as that person 2 loses. But it doesn’t work that way. This phenomenon is known as loss aversion and was discovered by Daniel Kahneman. Loss aversion is the human tendency to strongly prefer avoiding a loss to receiving a gain. Why do we have this? It gave us an evolutionary advantage, in order to survive we have to maximize opportunities and minimize threats. If we make decisions based on emotion we put a lot more emotional weight on avoiding a loss. To avoid this we have to think in terms of logic. In poker an amateur plays emotionally and tries to avoid losing money, whereas the professional uses logic to take advantage of a positive expected value situation. It is important to calculate the estimate outcomes rather correctly. Imagine we assume the coin is rigged and will come heads 90% of the time. If we are wrong and it is a fair, 50-50, coin we get a very different expected value calculation. The professional poker player can calculate the odds fairly correctly, but also has emotional challenges. After winning a big hand they can feel invincible and after losing a big hand they can take irresponsible risks to get back to even. This is known as tilt. Another cognitive bias that makes it difficult to estimate outcomes correctly is the optimism bias. This makes you underestimate the chance of experiencing an event with a negative outcome. People cost themselves lots of money by making decisions based on their emotions. Do you recognize this in yourself? Do you play to win or play to not lose? Now let’s apply this concept to business. Imagine you have the opportunity to buy a .com domain name for $10,000. The worst-case scenario is that you fail to attract any extra customers and lose $10,000. The best-case scenario is that you attract many new customers and profit $25,000. The $25,000 in this scenario is a made up number. For your own expected value calculation you can use as many details as you have available to get the numbers accurate. We are using conservative math, it is unlikely that 70% of the time we lose the whole $10,000. We can always resell the website or at least get a bit of extra traffic. What we can see is that even in the worst-case scenario we make, on average, a profitable decision. You might fear a 70% chance of losing $10,000, but if you invest with logic instead of emotion the decision is easy. Don’t leave the $500 on the table. Money is not always the correct variable to make expected value decisions. I made a negative expected value decision, in dollar terms, by taking private healthcare cover. The insurance deal is a financial positive expected value deal for the insurance company; this is how they make money. However, if something would happen to my health, and I was not covered, it could financially ruin me. Also, my health is extremely important to me and that is why I want to have the option to get the best care when needed. Additionally it gives me peace of mind, which I value greatly. All those reasons combined are why I’m happy to take a financial negative expected value deal. On the other hand when I buy a new computer, or any other gadget, I never take the extra insurance. I know this is a financially negative expected value decision for me because it is financially positive expected value for the insurance company. If I break the computer paying $1500 does not ruin me, so I decide to take the higher variance, but more profitable option by not insuring myself. To ensure they never go broke poker players use bankroll management to make calculated decisions as to how much money they want to invest. If you need a computer for your work and don’t have the financial capacity to replace it when necessary you might have to get the insurance. Imagine you’re the owner of a business with one employee and you have to write a report for a client. You value your time at $100 an hour and pay your employee $30 an hour. The report takes you 1 hour to complete and the employee will take 3 hours. It might be tempting to finish the report yourself because you are more time efficient, but that might not be the right decision. Your time is worth $100 an hour and you finish the task in 1 hour. Your employee’s time is worth $30 an hour and needs 3 hours to finish the task. The costs for you are 1 x $100 = $100. For your employee the costs are 3 x $30 = $90. Despite the fact that your employee takes three times longer you save $10. Delegating the report will give you the best financial result. We are used to compare outcomes and choose what feels best. We are letting our emotions instead of our logic make the decisions and that is costing us money and opportunities. Every time we pass on a positive expected value situation we are making a decision that hurts us. 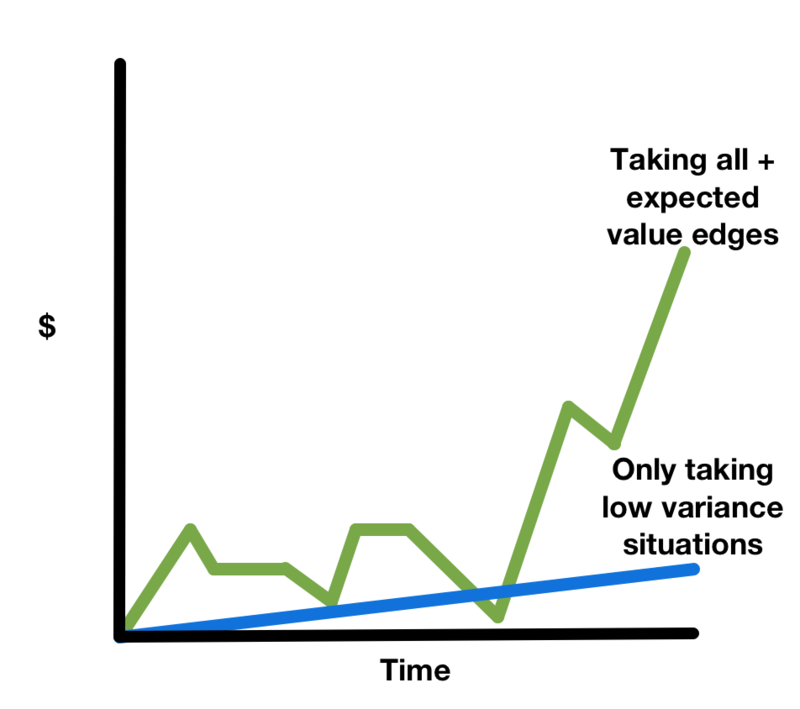 Use expected value to take calculated risks when it makes sense and do not let short-term variance discourage you. It will be very profitable in the end.